Following more than a year’s build-up of training and globe-trotting in search of hard-earned ITU qualifying points, on August 7th, 2012 Bermuda’s Tyler Butterfield lined up against 55 of the top short-course triathletes on the planet to contest for Olympic gold. 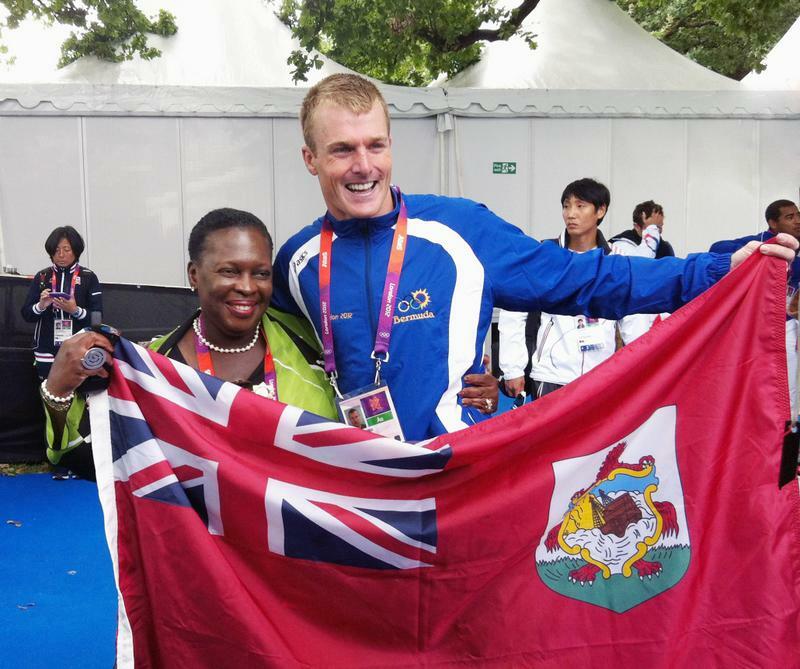 With the support of a dozen family members and numerous other family friends and sponsors on hand to watch the event, along with Bermudian fans waving their country’s flag throughout the course, Butterfield proudly represented Bermuda in his second Olympic Games. He ultimately crossed the line in 34th position, in what he reflected on as the best race he’s put together in his professional career. 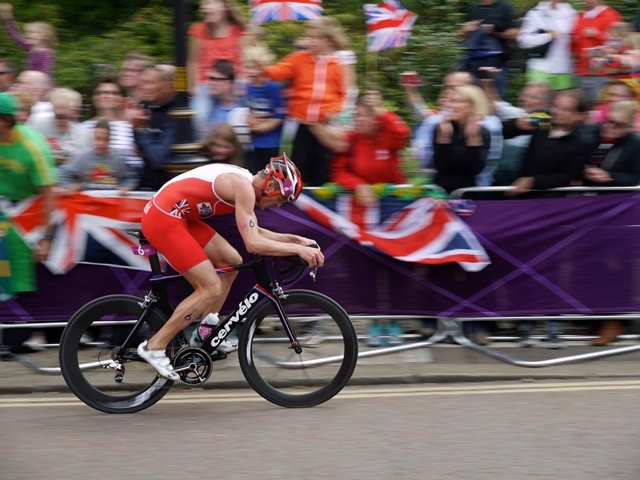 Butterfield’s swim saw him exit the water in the fifth pack after what can easily be called the fastest swim in triathlon history – the lead men went through the first 500 meters in a mere five minutes. Once onto the bike, Butterfield deployed his stellar cycling skill to aggressively bridge the gap between his pack and the next, and then the next. A lack of cohesion among this group of cyclists prevented the pack from cutting into the gap opened up by the lead group. Therefore, determined to give every ounce of effort in the Olympic competition and knowing that the medals would most certainly be divided among the athletes up the road, Butterfield eventually launched a solo attack. He rode into T2 20 seconds ahead of the group he had dropped, yet still one minute down from the race leaders. This tactic earned him the fastest bike split of the day, a scorching 58:32 over the 43-kilometer course. The intense effort on the bike did little to derail Butterfield’s leg speed on the run; in fact, his 31:52 run split was one of the fastest 10-kilometer times he has ever posted. And while the minute gap proved insurmountable in terms of front-of-the-pack contention, he reached the finish in 34th place, improving on his Olympic result from Athens (where he finished 35th), proud of his strong and aggressive race across all three disciplines and especially thrilled to fly the Bermudian flag across a world stage. Butterfield will now turn his focus to non-drafting events, predominantly in the U.S. Ideally, with an eye toward accumulating early qualifying points for the 2013 Ironman World Championship in Kona, he hopes to race Ironman Cozumel on November 25th, an event he also raced in 2009, earning entry to Kona 2010 with a 4th place finish. The Ironman World Championship now uses a collective points system for qualification, thus this plan would enable Butterfield to gain points as early as possible in order to avoid having to race a mid to late-season Ironman in 2013. Butterfield’s 2013 season will showcase a variety of race distances, the details of which will be determined following an analysis of his next big training block. A life time of hard work, dedication, blood, sweat and tears gets one to the olympics. The easier route is being a scum politician. Good job Tyler. &*#@ every leech. That commercial that ran during the olympics made me sick. “I’m running to London 2012″. Flying first class more like.